What is Cartridge Razor System? Cartridge razor is a simple device. It consists of two parts: a handle made of metal or plastic and a cartridge. The cartridge is two to five stainless blades in a plastic case. The cartridge is a replaceable thing. It’s up to you to decide when your cartridge has got dull already, but if your bristle is of average stiffness, you will have to change the cartridge after every four or five shaves. Cartridge razors have been very popular in the US ever since 1971 when they were first introduced. Schick and Gillette, two main manufacturers, have spent millions on ads convincing men that this kind of product is the best possible way of shaving. The number of blades in cartridges has grown from one to five, and so has the cartridge’s price. 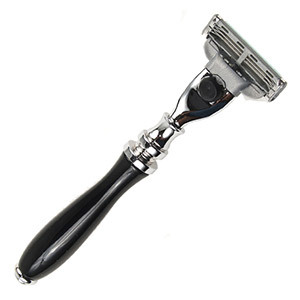 But it is still very difficult to notice the difference between shaving with a cartridge razor and that with a traditional one-blade safety razor, where you change not the cartridge but only the blade. The more so that those double-edge blades are manufactured mainly by the same two firms, Gillette and Schick. So it’s no wonder that many men felt duped and decided to go out of this race. Really, if you shave with, say, five-blade Fusion cartridges and change them once a week, it will cost you about $260 a year. Three-blade Mach3 will cost you $130. Compare it with maximum $35 you will pay for usual double-edgers for the same period and for the same result.